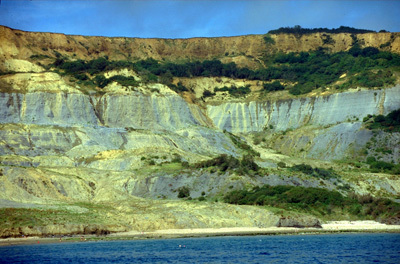 The cliffs at Charmouth are made up of layer upon layer of soft mud, silt and clay built up over many millions of years. These are classified as ‘Sedimentary Rocks’, as they are made up of billions of tiny particles of sediment that have been turned to stone by millions of years of pressure from the layers above. 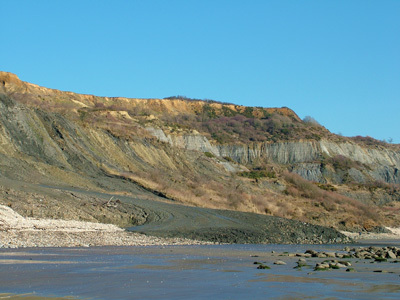 The layers in the Charmouth cliffs were laid down at the bottom of a calm sea around 195 million years ago during the Early Jurassic and are mostly made of mud, clay and limestone. Near the top of the cliff the rocks change from a dark grey colour to a golden yellow colour. This top Cretaceous layer sits over an uncomformity, a gap in time where the rock record has been worn away. This rock unit is called the Gault and Upper Greensand and was laid down around 100 million years ago. The cliffs around Charmouth are very unstable and there are mudflows and landslides all the time. Because of their instability it is important to act responsibly if you go fossil collecting. DO NOT hammer or try to dig into the cliff face, landslides or mudflows. The best fossils are found loose among the pebbles on the beach. Click here for top tips on fossil hunting and to see the Fossil Collecting Code.